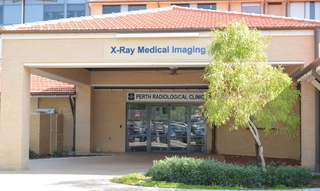 Dr Martin Marshall and our team of specialist Radiologists and professional staff continue to provide a comprehensive and cutting edge radiology service to the doctors and patients in and around the Joondalup community. The clinic is accessible from Shenton Ave and within the Joondalup Public Hospital, to the left of the Emergency Department. Parking: ALL parking is paid parking. Parking is available to the front of the hospital, enter via boom gates and take a ticket, then once finished take the ticket to the pay station located opposite the Emergency Department.